I don’t see any other way of getting the right-hand side of this photo looking more like the left. I think we are going to have to succumb and get a gardener, even though we can’t really afford it. Those things in pots are courgettes which really need to get into the weed-filled bed on the right in the next couple of weeks. 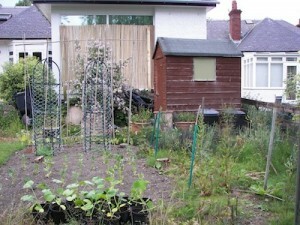 And this is with a really cut-down croppage this year: no brassicae or root veg, just peas, beans, and courgettes. And still we can’t keep up.